I have a After Turkey Day Recipe to pass along to all of you, Tex-Mex Turkey Rice Skillet. Enjoy those leftovers! * Substitute or add any Ingredient with any of your leftovers from Thanksgiving. 1 – Heat 1 tablespoon of the oil in large skillet on medium heat. Add rice; cook and stir until rice turns light golden brown, about 3 minutes. Stir in salsa and broth. Cover skillet, reduce heat to low. Simmer 15 minutes or until rice is tender. 2 – Heat remaining 1 tablespoon oil in a second skillet on medium-high heat. Add zucchini and onion. Cook and stir 5 minutes or until vegetables just start to brown on edges. Add corn after 3 minutes. Add turkey to vegetables; keep warm until rice is done. 3 – Stir vegetables and turkey into rice mixture. Continue heating 2 minutes or until turkey is hot. 4 – Sprinkle with cheese, cover. Remove from heat and let stand 5 minutes. I used Kroger Private Selection Smoked Off the Bone Sliced Ham, Boar’s Head Honey Smoked Turkey Breast, and Kahn’s Deluxe Bologna for my Baked Mini Sub. I had picked the Turkey up while at Jungle Jim’s Market yesterday. Then I used a Meijer Wheat Mini Sub Bun. Layered the Meats on the Bun and topped it with some Kraft Reduced Fat Mayo w/ Olive Oil and Sweet Hot Stone Ground Mustard and a thin slice of Sargento Ultra Thin Swiss Cheese. I brushed some Extra Virgin Olive Oil on the top bun, which makes it brown up better. I baked it in a shallow baking pan at 400 degrees until the Cheese started to melt and the Meats were heated. 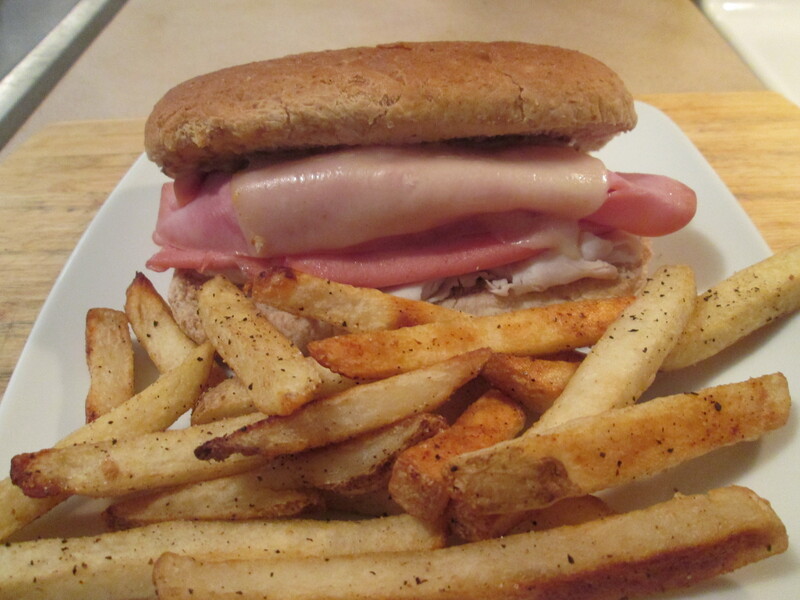 I love using these Meijer Wheat Mini Sub Buns, their just the right size and they toast up fantastic! I also baked some Ore Ida Simply Cracked Black Pepper and Sea Salt Country Style Fries, served these with a side of Hunt’s Ketchup for dipping. For dessert later a Healthy Choice Dark Fudge Swirl Frozen Greek Yogurt. An all white turkey breast, lightly smoked and dipped in golden honey for a smoky, sweet flavor that is sure to be a favorite. Wonderful on Sourdough bread with lettuce, tomato, and our Vermont Cheddar Cheese for a lunchtime treat. Our warmest day of the year so far, 80 degrees! It was even a bit humid (blah) and partly sunny. Went to the grocery early this morning and then back home. Then I worked on cleaning the shed out a bit. Mom and Dad has boxes packed with stuff they haven’t seen in 5 years or more, so it’s out with the old. I barely made a dent in all the boxes, this will take a while. For dinner something a little different, I prepared a Baked Cold Cut Trio Mini Sub w/ Creamy Tomato Soup. I used a Trio of Cold Cuts for my Baked Mini Sub; Kahn’s Deluxe Bologna, Kroger Private Selection Off – the Bone Smokehouse Ham, and Private Selection Roasted Turkey. For toppings Boar’s Head Sliced Muenster Cheese and Kraft Reduced fat Mayo w/ Olive Oil. For the Bun I used Perfection Deli Mini Wheat Sub Buns, I buy these at Meijer. 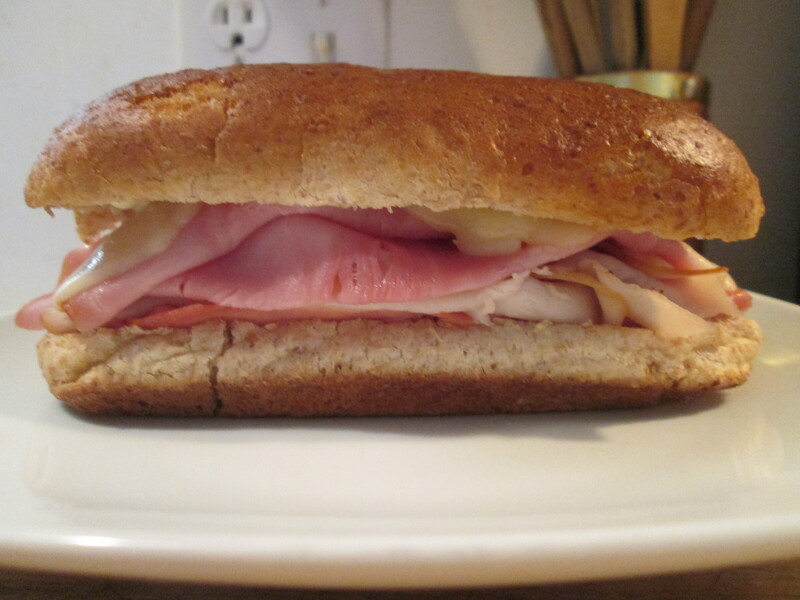 To prepare it I spread the Mayo on the bottom bun and layered my Cold Cuts on top of that. Topped that with Cheese and spread more Mayo on the bottom of the top bun. To help the bun brown a bit I brushed the top with Extra Virgin Olive Oil. I had already preheated the oven to 400 degrees, I then laid the Sub on a small baking sheet and baked it for about 12 minutes. Took it out and the Sub was a light golden brown and the Cheese was melted. I love using Muenster Cheese for when I melt Cheese on Sandwiches, it melts perfect for that. The Sub tasted great, all the Cold Cuts worked great together, then the with the Muenster Cheese and Mayo give it a perfect taste! Then I also heated up some Amy’s Organic Creamy Tomato Soup. 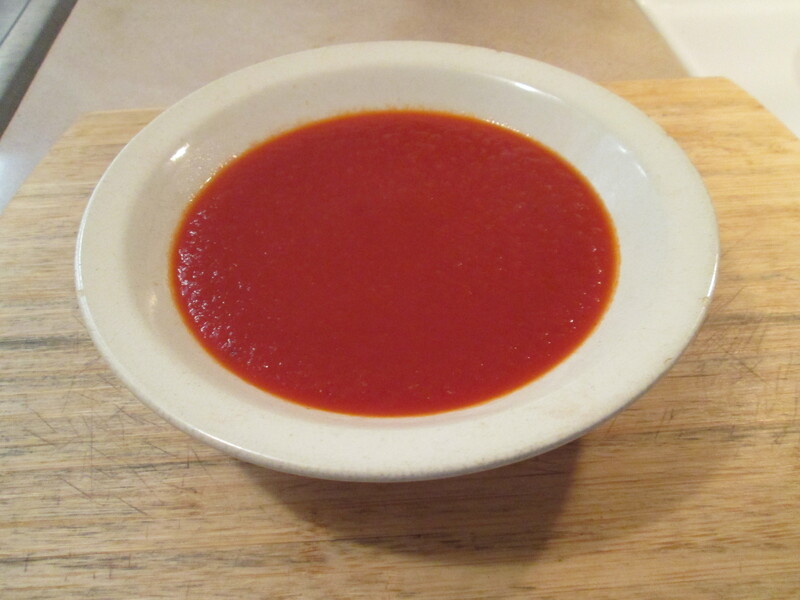 My favorite Tomato Soup by far. I’ve been using this a couple of years now. Creamy with a fantastic flavor and it’s 110 calories and 19 carbs. I also had a Diet Dr. Pepper to drink. For dessert later a Healthy Choice Dark Fudge Swirl Frozen Yogurt. 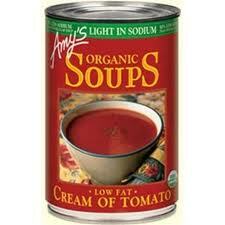 Contains 340mg of sodium compared to 690mg in Amy’s regular Cream of Tomato soup. This morning it was about 54 degrees, but I guess that was our high for the day as it’s been dropping ever since. rain on and off and windy, blowing in our winter storm I guess. We’re supposed to get 2″-4″, we’ll see though. Got my tests results back and my sugar looked real good they said as did everything else except for my thyroid, which it was a little off. I just have to adjust my medicine. As most former Cancer patients, you usually have a Thyroid trouble depending on your type of Cancer and treatment. For dinner tonight; it’s Turkey Tacos Night! 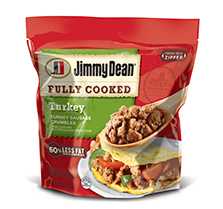 For the Turkey I used Jimmy Dean Fully Cooked Turkey Sausage Crumbles. Kroger had the bags on sale so I thought I would give it a try! It comes pre-cooked so all you have to do is heat it up for about 8 minutes. As it was heating I added Sea Salt, Cilantro Flakes, and a 1/2 packet of Old El Paso Low Sodium Taco Seasoning. I really liked this! Great taste and real easy to heat up and use. I’ll buy another bag and keep it in the freezer. 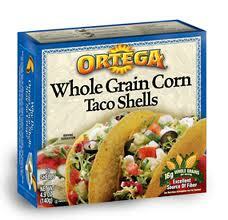 I used Ortega Whole Grain Corn Taco Shells. Their a good size Taco Shell with 110 calories and 12 Net carbs per serving (2 Shells). 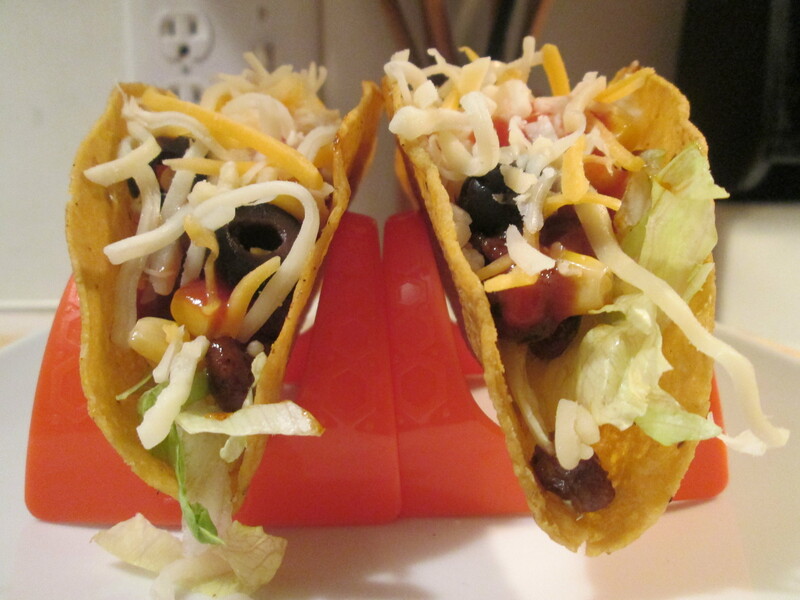 Then for my other Taco ingredients I used 2 tablespoons of Del Monte Summer Crisp Sweet Corn Kernels, sliced Black Olives, Shredded Lettuce, and Sargento Reduced Fat Mexican 4 Cheese. I topped them with Daisy Reduced Fat Sour Cream and Old El Paso Original Taco Sauce. When building my Tacos I always use the Shredded Lettuce as the first layer. The Lettuce helps soak up any moisture so the bottom of your Taco doesn’t get soggy. I love Tacos, easy to make and always delicious! For dessert later a Healthy Choice Chocolate Swirl Frozen Yogurt. Remove sausage crumbles from package and place in a large skillet. Heat and stir over MEDIUM heat for 6 to 8 minutes or until hot. Place ½-cup sausage crumbles into a microwave-safe bowl; cover with plastic wrap. Microwave on HIGH for 30-40 seconds or until hot. Stir before serving. Once opened, use or freeze within 7 days. INGREDIENTS: TURKEY, CONTAINS 2% OR LESS OF: WATER, SALT, POTASSIUM LACTATE, SODIUM LACTATE, DEXTROSE, SUGAR, SPICES, CARAMEL COLOR, YEAST EXTRACT, SODIUM DIACETATE, BHT, CITRIC ACID. COOKED IN BEEF FAT. Happy Thanksgiving Everyone! We had a quiet day and dinner, just Mom, Dad, and myself. There will be more later in the day and evening coming over. The wind that we’ve had has died down finally but it’s only a high in the low 30’s but it’s sunny out. 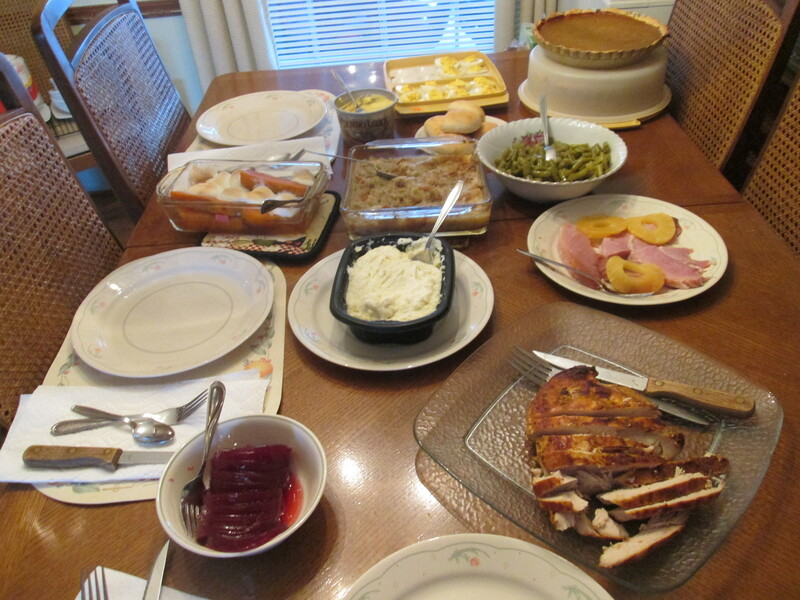 For dinner tonight; Our Thanksgiving Meal. We had Turkey, Ham, Stuffing, and Beans with all the other trimmings in between! 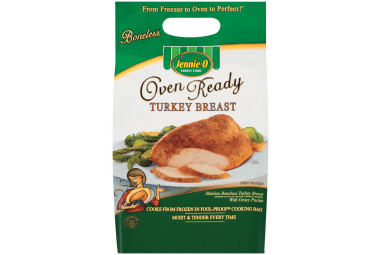 I prepared a Jennie – O Oven Ready Turkey Breast. This is the easiest Turkey Breast there is to prepare! Preheat your oven to 375 degrees and remove the frozen Turkey from the outer package. Keep the Turkey in it’s cooking bag and place it in a roasting pan. Roast it for 2 1/2 to 3 hours making sure the Turkey reads at least 170 degrees. You have your Thanksgiving Gobbler! Simple, easy, and delicious. For the Ham we used a Cook’s Bone-In Ham (1/2 Ham). My Mom prepared that last night so it was ready for today’s feast. Then for our side dishes we had; Mashed Potatoes, Brown Gravy, Green Beans (a quart of the Greens Beans we canned earlier in the year), Home Made Stuffing (Mom prepared this), Deviled Eggs, and Baked Rolls. Plus for dessert my Mom baked a couple of pies, a Pumpkin Pie and an Apple Pie. Both were made by using Splenda. I’m not big on Pumpkin Pie but that Apple Pie won’t stand a chance later this evening! 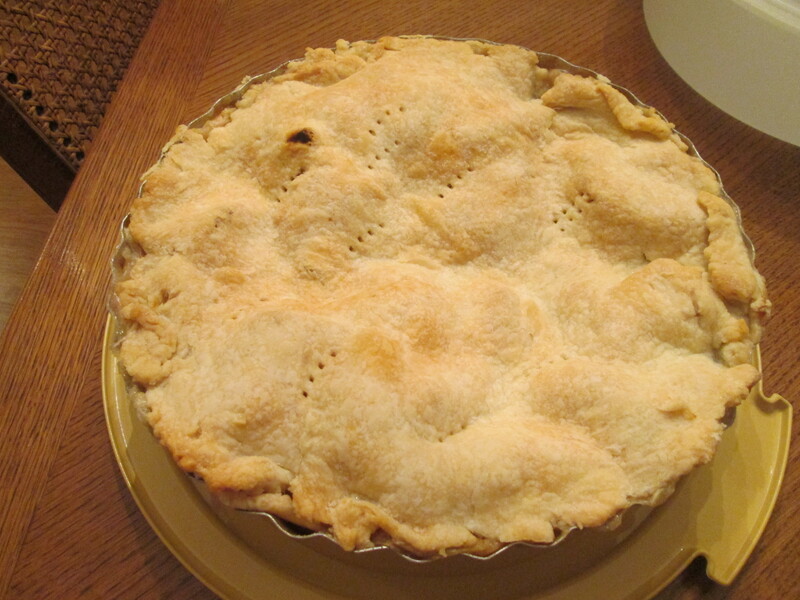 For dessert later a slice of Apple Pie with a scoop of Breyer’s Carb Smart Vanilla Ice Cream! Only one way to describe this, “It was a feast!” Once again Happy Thanksgiving to you all and say a prayer later for our Country and all Military Men and Women serving our country! Get all the great benefits of Oven Ready™ in a smaller-sized boneless and skinless turkey breast; this delicious home-cooked turkey breast is the perfect dinner to serve year-round.Goes directly from your freezer to your oven with no thawing. Remove frozen turkey from white outer package. Do not remove turkey from FOOL PROOF. cooking bag. Place in a roasting pan with at least 2″ high sides. Note – Do not increase oven temperature, cooking bag may melt at higher temperatures. Cut three 1/2 inch slits in top of FOOL PROOF. cooking bag. Place pan in oven, allowing room for bag to expand without touching the oven racks or walls. Roast the turkey until a meat thermometer reaches 170°F. Note – Meat temperature increases rapidly during last hour of cooking. Let turkey rest 10 minutes, cut open top of oven bag. Watch out for hot steam and juices. Heat gravy as directed on pouch. 2 – 3 lbs 2-1/2 to 3 hours. Healthy Bird recipes for your Holiday Bird, from the Delish we site. Happy Thanksgiving! This year, try something new with your Thanksgiving bird. From turkey to pheasant, EatingWell has wholesome and hearty fare that will bring not just healthy eating to your table, but plenty of smiles too. Spice up your Thanksgiving by giving your turkey a bit of zest. Ground cinnamon, toasted cumin, and smoked paprika come together to form a rub inspired by the flavors of the Southwest. Don’t worry, whether you’re from New England or New Mexico, this spicy rub will be a welcome addition at the holiday table. (And did we mention it’s loaded with nutrients like iron, zinc, and selenium?)….. We all do it, feast on Turkey and all the trimmings and asleep on the couch before the second football game of the day is on. I had always heard it was the Turkey, well maybe it’s not. 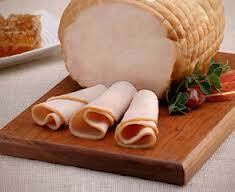 Find out, good article on the Turkey Effects from Huffington Post web site. I left the link at the bottom of the page so you can read it all. It feels like there is a simultaneous conversation happening at Thanksgiving tables across the country. You eat a big meal — which includes a generous helping of turkey — and all of a sudden you’re feeling like you really want to lie down and take a nap. “It’s the tryptophan,” says Aunt Doris or Grandma Peggy or that cousin who always makes a big point of announcing that she’s watching her weight this year. Everyone nods in agreement, as if the tryptophan is a perfectly reasonable excuse. Unfortunately, the reality is that you just ate way too much. It’s high time that we set the record straight. Tryptophan does not make you sleepy. You do not feel like this on Thanksgiving because of tryptophan:…..
* Read the article and get the facts by clicking the link below. From the Delish web site its 23 Thanksgiving Appetizer Recipes! I’ve left the link to get them all at the bottom of the post. Thanksgiving feast running late? No problem! Tide them over with these amazing Thanksgiving appetizer recipes like sweet onion dip, salmon mousse, or fried herbed almonds. Looking for ideas for the main event? Try the Thanksgiving menu from Food & Wine or the ingenious make-ahead Thanksgiving menu from Real Simple.